RV Parks in Kenai Alaska from Kenai Landing to camping on the beach at the mouth of the Kenai River, we review the options for RV Camping in Kenai Alaska. Locating Camping on the Kenai. While there is a private campground within the city limits of Kenai we have yet to visit it. Most all of the camping we have done on the Kenai Peninsula has been around Soldotna as that's where the majority of everything happens in the summer. For the most part the city of Kenai rely's heavily upon the Alaskan residents that descend upon the beaches at the mouth of the Kenai River each summer. Residents converge to the beaches to take part in the personal use dipnet fishery in an all out onslaught upon the tremendous runs for sockeye salmon returning each June. 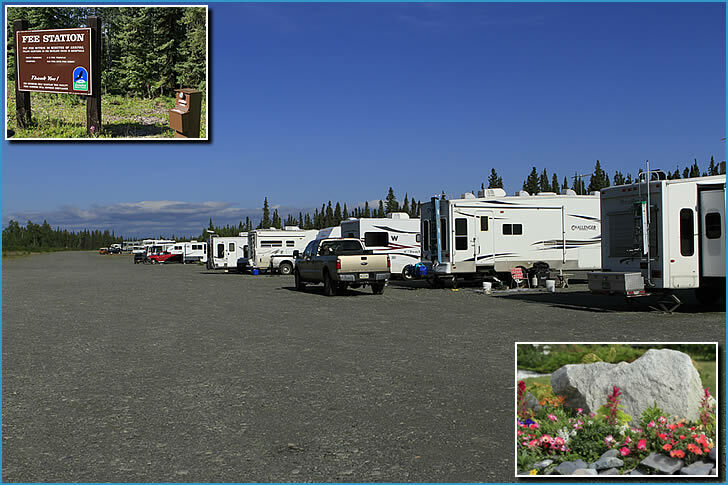 Kenai Alaska Campgrounds covers the local camping options in Kenai Alaska. From Free Camping at Walmart to camping on the beach at the mouth of the Kenai River, we review the options for Kenai Alaska campgrounds. 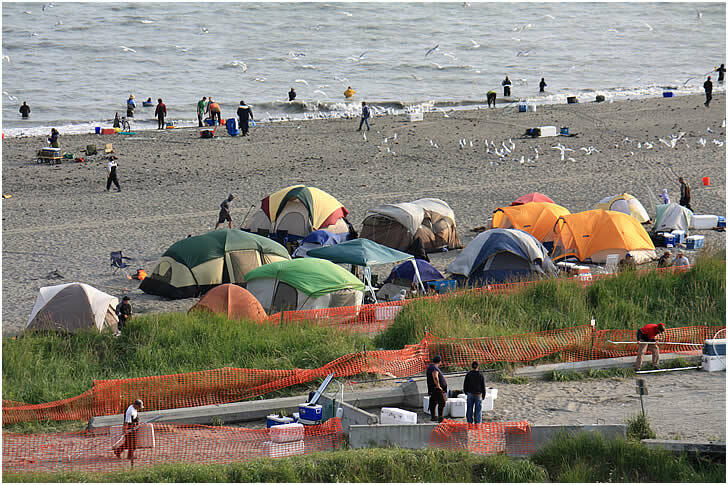 With a limited number of RV Parks in Kenai to accommodate the massive influx of dipnetting Alaskan residents, everyplace where a camper can camp will be highly sought after for this three week period in July. The largest and possibly the best campground in Kenai actually lye's across the river from the town itself. Kenai Landing RV Park is located at 2101 Bowpicker Lane, Kenai Landing is not just a RV Park but also offers a new hotel and activity center including local tours, Alaska fishing charters, cabin rentals and much more all in the midst's of a restored historic cannery site on the banks of the Kenai River. Also available is a convenient paved boat launch with a dock and mooring. Unfortunately, Kenai Landing has closed and we still are unsure if it will be open for the 2016 dipnet season. Campgrounds in Kenai that offer river access have long been popular with fishermen looking to catch one of the renowned Kenai River monstrous king salmon that once were so prolific in the waters of this popular fishing destination. Need lodging for the coming Kenai River dipnetting season? Take a look at Kenai River Cabins and Kenai River Cabin Rentals for those looking for something not on wheels. 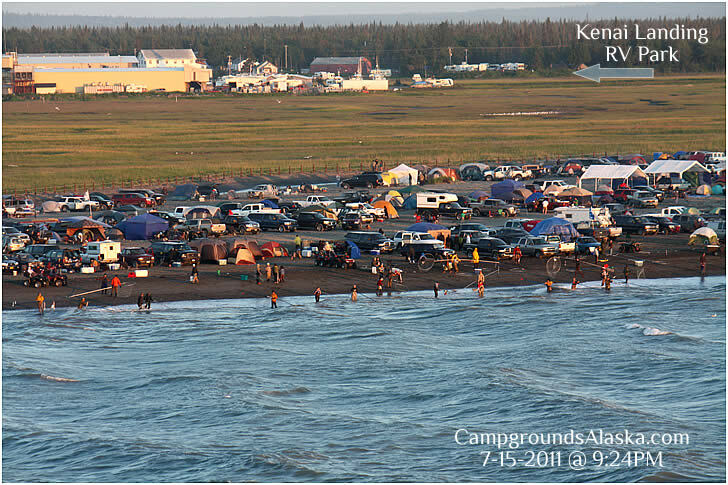 Kenai River Dipnetting is often accompanied by camping on the beach in Kenai or in one of the provided parking lots at the foot of Forest Drive where the Kenai River meets Cook Inlet. When no services, electrical, sewer or water, are required, dry camping at Walmart in Kenai Alaska is also a very popular option to the much higher priced RV parks.